First off, let’s start with a cucumber salad that’s delightfully creamy. A salad is always nutritious, but some understandably do not have a good taste. This one, however, is both delicious and healthy for you and your family. These are the ingredients you will need: one cucumber, one big tomato, a tablespoon of mayonnaise, some salt, and some fresh dill herbs. So, how do we prepare this creamy cucumber salad? First, we must peel the cucumber before slicing it up into smaller pieces. Once the cucumbers have been thoroughly chopped, we must add the mayonnaise. Stir it well, then add salt and dill to add more flavor. It’s entirely up to you how much salt and dill herbs you’d like to have for your salad. Afterward, slice up some tomatoes and put them into the mix. After this, you simply have to let it chill for about half an hour before you feast on this yummy salad. This meal will only take you half an hour to prepare. It doesn’t have any meat, but it’s packed enough to make you full. For this, you will need to prepare the following: half a teaspoon of kosher salt, half a cup of toasted and chopped walnuts, four teaspoons of minced garlic, four teaspoons of extra-virgin olive oil, a pound of trimmed green beans, and two teaspoons of balsamic vinegar. The first step is to medium heat the extra-virgin olive oil in a skillet. Next, add in the minced garlic and keep stirring it for up to 90 seconds. What matters is that it will turn brown. Once done, pour the garlic into a mixing bowl. Next, pour two inches of water into a pot attached with a steamer. Let the water boil then put green beans inside the steamer. Cover it for about five minutes, which is the typical time it takes for green beans to be crispy and completely cooked. Finally, put the green beans into the mixing bowl and put walnuts, balsamic vinegar, and salt. How about some good old baked potatoes? This is very easy to prepare yet contains that familiar good taste of potatoes. To make this dish, you need extra-virgin olive oil, salt, and potatoes. While we like the taste of baked potatoes as it is, we still think you should experiment with your chosen herbs and spices. First, don’t forget to clean the potatoes by washing them well. Next, peel them and slice them however way you like. Put them into a bowl then add the olive oil and salt. Stir the potatoes well enough for it to be coated with the oil and salt. Now, we get to the baking process. Place the potatoes into a bar pan then put them in the oven. The temperature should be set at 400 degrees Fahrenheit and let the potatoes get baked until they become soft. Do flip them after about 15 or 20 minutes. After half an hour or so, you have a nice meal of baked potatoes. How about a nutritious sandwich? Here, we’ll be preparing a sandwich containing shaved beet. As the name implies, you’ll need a medium-sized beet, some balsamic vinaigrette, bread, butter, salad greens, chopped red onions, cheese, and some salt and pepper. For the cheese, it’s up to you whether you’re getting feta cheese, goat cheese, or any other variant. First, peel the beet and make thin slices using a mandolin or the sharpest knife you have. Put the beet slices in a bowl and put a tablespoon of balsamic vinaigrette. Next, add a bit of salt and pepper and let them be for 20 minutes. Now, you have to make an open-faced sandwich. This is done by putting salad greens, sliced beets, and cheese on buttered bread. If you want, you can skip the bread and have this as a salad. Finally, we have a scrumptious dish you can make if you grow butternut squash. The ingredients include the following: two teaspoons of dried sage, kosher salt, two tablespoons of extra-virgin olive oil, a quarter teaspoon of ground black pepper, two medium-sized onions cut into chunks, and a medium-sized butternut squash. First, you must cover the inner section of a sizable pan with foil. You can use a baking pan or a roasting pan. Next, put a bit of oil on the foil or use a non-stick spray. As for the oven, heat it up to 400 degrees Fahrenheit. Now, peel the butternut squash and slice it in half. Do this lengthwise and do not forget to remove the seeds. After slicing it into two pieces, you should cut them into one-inch cubes. Mix the squash cubes with onions, extra-virgin olive oil, ground black pepper, and dried sage. Put them all on a baking sheet and add a pinch of salt and pepper. Finally, roast them for about half an hour or longer, just until the squash feels tender and becomes light brown in color. There you have it. All of these meals are easy to prepare and make good use of your garden vegetables. 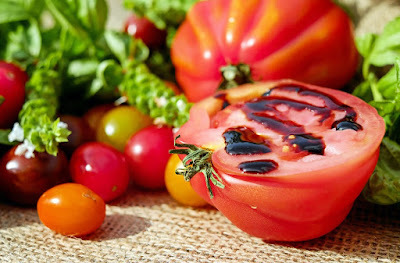 We hoped this list inspired you to try new dishes using what you grow. If you have any questions, feel free to give a comment.